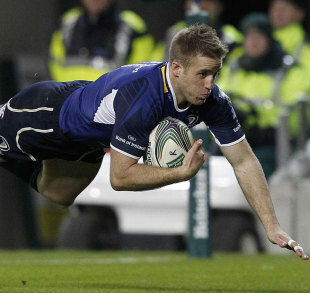 Leinster have given the clearest indication yet that star winger Luke Fitzgerald is ready to re-sign with the province. Doubts have been cast over the future of their British & Irish Lions Test winger with Leinster reportedly offering him a lower contract than his current deal. But Leinster manager Guy Easterby has revealed that he expects the 24-year-old to stay in Dublin. "It was made clear last week that we wouldn't revisit it because of the week that was in it, but we'd certainly be keen to have something done before the (Heineken Cup) semi-final week and we'd hope to give you something before the start of that week," Easterby told the Irish Independent. "The IRFU have been working very hard to enable Luke to have the option of staying. And he has made it clear to us that he'd be keen to stay. We're still hopeful that a deal can be done. "I know the IRFU are very keen for him to stay and therefore there is a process to go through that we all understand. They are working very hard. He's a 24-year-old kid and they want him here for the foreseeable future, as we all do." Meanwhile Irish rivals Munster have revealed that they are unlikely to add any more stellar names to their squad ahead of next season despite their premature exit from the Heineken Cup. The province's chief executive officer Gary Fitzgerald told the Limerick Leader that they have used up their quota of non-Irish players for next year.